NEW for 2018 — Classic carbine configuration of the Model 1873 with barrel band, strap buttplate, saddle ring and straight grip walnut stock. Drilled/tapped for optional receiver mounted peep sight. Now you can own the real thing. 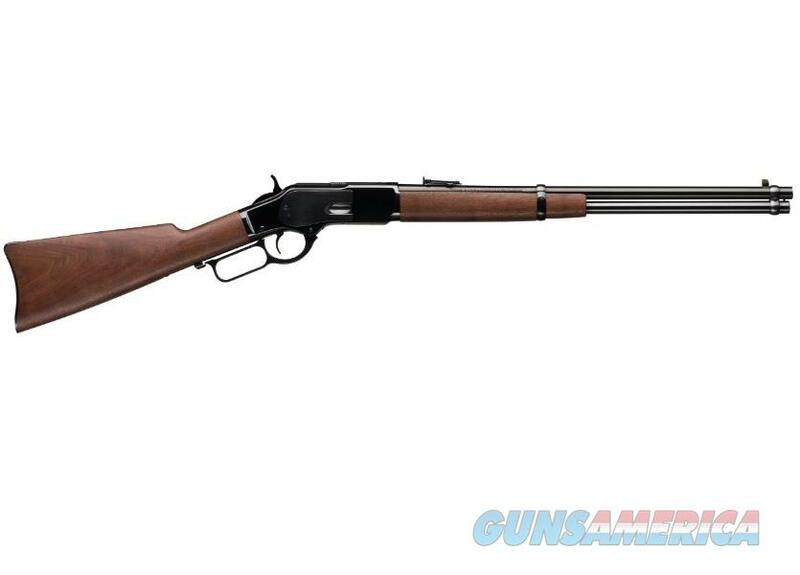 This is a genuine Winchester Repeating Arms® Model '73 with an oil-finished walnut stock, classic blued steel carbine strap buttplate and a 20" round barrel with a full-length magazine, just like the original. Semi-buckhorn rear sights with Marble Arms® Gold Bead front sight gets you on target quickly. Steel loading gate for smoother loading. Receiver rear tang is drilled and tapped for optional tang-mounted rear sight for a more precise sight picture (sight not included). If you’re the type of collector or hunter who won’t settle for second best or a copy of a copy, fill your hands with this magnificent rifle, saddle up and blaze your trail into the sunset.